Equalization is one of the most important — and widely used — techniques throughout the mixing process, from first tracking instruments through cleaning up segments of a final mix. It’s the most efficient and effective way boost or cut specific frequencies, making EQing an indispensable tool for creating depth and space in a mix, emphasizing frequencies that bring out the best qualities of a sound, isolating or removing specific frequencies, remedying conflicting frequency ranges between different tracks to achieve clarity, and much more. 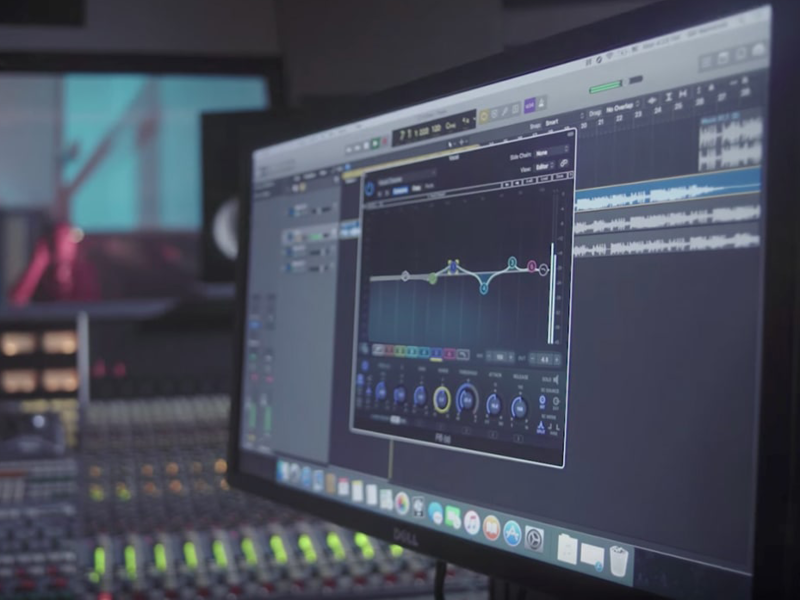 As a critical process for creating a polished track with a professional sound, it was inevitable that that equalization technology would be improved by ingenious software companies. Enter dynamic equalization, the exciting next step for an age–old mixing utility. The most commonly used equalizers are parametric, semi-parametric, graphic, and shelving equalizers. Additionally, software equalizers can either be based on entirely unique digital algorithms like FabFilter’s Pro–Q 2 or modeled after analog gear like the Waves PuigTech EQs. Just like with hardware, all software EQs have distinct characters and ideal applications. But they all share one thing in common, which is that once you dial in your EQ, its settings are static and will effect an instrument track or mix for the duration of a track. Dynamic EQ plugins are advanced equalizers that combine the precision of traditional parametric equalization with the dynamic control of multi–band compression or expansion. This melding of the two most essential processing approaches gives you a higher level of control over shaping and enhancing sounds. What are the major differences between traditional parametric and dynamic equalizers you may ask? Well, traditional equalizers are static and considered to be linear processors, meaning they treat the audio continuously. For example, any cuts or boosts of the filters will affect the audio the same way throughout a song, unless you automate those parameters. Dynamic equalizers, on the other hand, are nonlinear processors that react to either the internal audio source or are triggered by a sidechain source. They also provide additional functionality commonly found on compressors such as threshold, attack, and release controls. When the incoming audio passes a set threshold level, the EQ filter will either cut or boost those frequencies set by the user. This ability gives you pinpoint precision of the specific frequency ranges you're boosting or cutting. Some of you following at home may be going, “But isn’t this how multi–band compression works?” Indeed, it’s a similar idea, but the big difference is that dynamic equalizers use traditional EQ filter shapes rather than crossover filters, which makes these a bit more straightforward to use than multi–band compressors. Dynamic EQs can be used to treat a wide range of material, from individual instrument tracks to the mastering chain you apply to your final mix. Dynamic equalization works great for automatically boosting or cutting frequencies or taming or enhancing sounds, respectively, when needed. Let's delve even deeper into dynamic equalization. At times, you may find two or more elements in a mix that occupy the same frequency range, such as the kick and bass. These conflicting frequencies can drown out the punch of a kick or cause headroom problems. One way to approach this issue is to cut the problematic frequencies from the bass to create room for the kick. However, cutting a notch in the bass that allows the kick to punch through the mix more clearly will affect the sound of the bass throughout the entire song, even when the kick is not playing. This will rob the bass sound of a lot of power. You could draw automation for that band of the EQ to stop cutting the bass when the kick is not playing, or you can let a dynamic EQ do the work for you. For example, you could set the specific frequencies you wish to cut from the bass and then use the kick as a sidechain trigger along with fast attack and release times to quickly cut those frequencies from the bass whenever the kick is played. This approach is similar to traditional sidechain compression, but dynamic equalization gives you more accurate control over the frequencies you're cutting. This often leads to a more musical and natural sound. In fact, setting up a dynamic EQs to react like a compressor while boosting or cutting specific frequencies is the most common way to deploy the effect. When mixing vocals, for instance, a dynamic EQ can cut harsh frequencies when they sound, helping balance a recording when a singer’s tone changes over the course of a performance. That dynamic EQ can also be used as a de–esser for fixing sibilance and plosives sounds. When mixing drums and various instruments, you can boost the more musical percussive frequencies to up their presence in the mix. Dynamic EQing is also great for cutting rogue transient spikes or resonating tones. Likewise, this technique can be used to make sure drums covering the same frequency range aren’t getting in each other’s way. 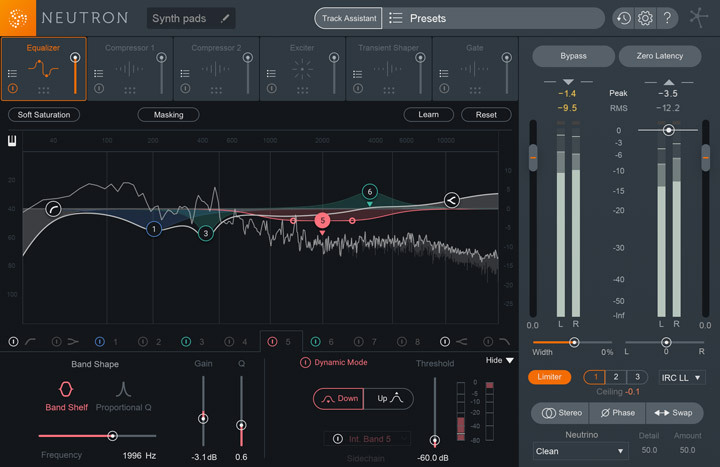 When using a dynamic EQ on an entire mix, you’ll find they’re great for cleaning up the high– or low–end of a mix. They can also be used to tighten up sounds, much like how a gate works when set up to respond as an expander. Most of the dynamic equalizers on the market offer similar features and controls. Below are some key features commonly offered on most dynamic equalizers. Six or more floating, fully adjustable parametric filter bands. Various filter shapes, including Baxandall Treble, Baxandall Bass, Proportional Q, Band Shelf, and Peak Bell. Advanced EQ and compression/expansion controls per band. Internal and external sidechaining options. Mid/Side and Left/Right processing modes. Controls for Frequency, Resonance, Gain, Attack, and Release per band. Setting up a dynamic equalizer to dynamically cut or boost throughout a mix is fairly simple. The following basic steps provide a good starting point when working with a dynamic equalizer. Keep in mind that these are general settings, and many of these features will vary depending on the plugin you're working with. Set any of the filter bands to the frequencies you wish to cut or boost by either dialing in the frequency control or simply dragging a filter node. Once you determine the appropriate frequency, choose the filter type that best suits your needs. Set a threshold to an approximate signal level for each active band. When the signal exceeds this level, the filter will be dynamically triggered. You can dial this setting to taste once you begin playback. Adjust the gain, attack, and release parameters to control how much of the set frequency to cut or boost, how quickly the filter reacts to dynamic triggering, and how quickly the filter returns from dynamic triggering. Choose to trigger the effect with either an internal or external sidechain input. Internal sidechaining means the dynamic triggering will respond to the current input signal. External sidechaining requires more setup and is used when you want an external input to trigger the filters. For example, you could use a kick track as an input to dynamically trigger a low cut filter on a bass track to quickly remove competing low frequencies every time the kick hits. Determine if you want a specific filter band to behave as a compressor or an expander. Typically, dynamic equalizers act most similarly to a multi–band compressor, with boosts reduced and low sounds made louder whenever audio exceeds the threshold of a given band. However, you can also invert this behavior so that the filters react more like an expander. In expansion mode, the more a signal passes the threshold, the more dramatically all sounds are pushed. For example, if you wanted to bring out the snare in a mix, you could adjust a filter to boost at the appropriate frequency and then set the dynamic settings to react to the level of the snare hits. This boosting of the filter will only trigger when the snare is present, therefore expanding the dynamic range of the set frequencies. Finally, determine if you wish to effect Mid/Side or Left/Right by setting the appropriate processing modes.